We have pretty awesome robots these days, but they all seem to lack in at least one area: the hands. Check out how researchers are working to resolve this issue. I’ve written previously on advances being made in the development of dexterous robotics that are being used in fields as diverse as oceanography and medicine. Despite these advances, there is still much work to be done on creating more dexterous robotic digits that are capable of doing simple (to us) tasks such as rolling, bending, and pivoting. 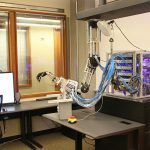 There are signs that progress is being made, with a team from the University of Washington developing a robot hand that can do many of these tasks without human direction. The team has spent a number of years developing extremely capable five-fingered robotic hands, with their latest demonstration (below) showing just how far they’ve come. What makes the hand particularly powerful is that it’s capable of learning from each attempt. It utilizes machine learning to develop models of the physics involved in a task, and then to decode the actions required to fulfill it. The team believes that their method provides a scalability to robotics that isn’t possible in methods that require hand-coded instructions. “Usually people look at a motion and try to determine what exactly needs to happen — the pinky needs to move that way, so we’ll put some rules in and try it and if something doesn’t work, oh the middle finger moved too much and the pen tilted, so we’ll try another rule,” they say. In other words, we’re often unaware of how we achieve a particular movement, so coding a robot to perform it is pretty tough. Enabling them to learn from their own experience, however, is much more promising. The approach is not without significant challenges, however. For instance, building such a device requires a level of strength, flexibility and responsiveness that is on a par with human hands. They achieve this by using a Shadow Hand skeleton that’s actuated with a pneumatic system that is capable of speeds above that of a human hand. Alas, the hand cost $300,000 to develop, so it’s not really suitable for commercial use, but it does provide a nice test case for the technology. The approach is robust, however, having first undergone a number of computer simulations to fine-tune the algorithm, before then transferring it to an actual five-fingered robotic hand. It was at this stage that really useful data was collected to enable the machine to learn at speed. Whilst it isn’t ready for commercial release yet, it is nonetheless fascinating to see how it progresses, with next steps including the demonstration of global learning based upon the experiences of other robotic hands. It’s an approach I’ve written about previously, as projects such as RoboBrain attempt to provide a unified knowledge commons for robots to tap into.